Karim Benzema, Edin Dzeko, Javier Hernandez and Salomon Kalou are reportedly January transfer targets for Arsenal as the club look to lower the demands of their lone front man Olivier Giroud. Giroud, who is expected to play for France against Ukraine in the World Cup qualifier on Friday night alongside Bacary Sagna and Laurent Koscielny, has started every Premier League and Champions League match for the Gunners this season (17 in total), scoring eight goals. Arsene Wenger is now looking to ease the burden on Giroud, and the only other target man in the squad is Nicklas Bendtner. Koscielny had admitted that his international and club team-mate is in need of a rest. A knee problem has concerned the Frenchman all season, and he not scored in his last four matches for Arsenal. “He’s also playing game after game and hasn’t had a rest, so maybe he’s feeling a bit of fatigue,” Koscielny said this week. Benzema is entering the final 18 months of his contract, and, despite playing regularly this season, a bid of around £25-£30m would tempt Real Madrid. High offers could also be considered for Manchester City’s Dzeko and Manchester United’s Hernandez, with both players struggling for starts this season at their respective clubs. The former Chelsea forward Salomon Kalou, now at Lille, is a player that Wenger has previously coveted, and the 28-year-old is understood to be keen on a move back to the Premier League. Nicklas Bendtner has reiterated his desire to secure a move away from Arsenal, preferably in the January window. The 25-year-old came close to leaving Emirates Stadium over the summer, with talks held with Crystal Palace. 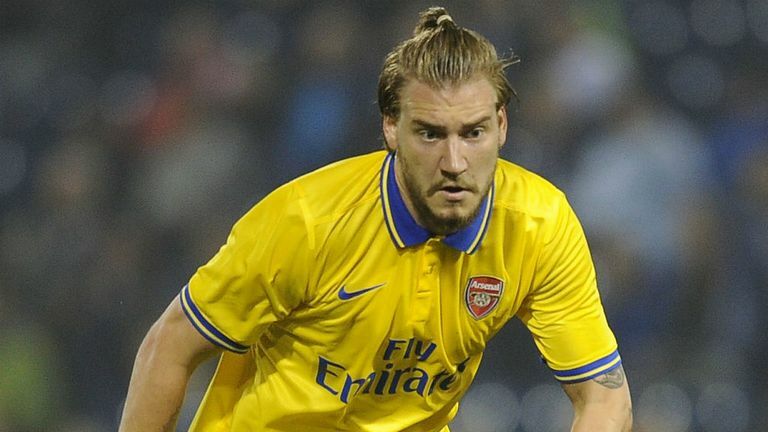 No deal was agreed, though, and Bendtner – who has spent the last two seasons on loan at Sunderland and Juventus – remains on the Gunners’ books. He finds himself behind Olivier Giroud in the striking pecking order and has made sporadic outings off the bench this term. With there clearly no long-term future for him in north London, Bendtner hopes his transfer wish will be granted in the new year – with the Denmark international adamant that sporting factors, rather than money, will influence his decision. “I want to get away from Arsenal. Whether it is in the winter, we must wait and see,” he told reporters while away on international duty. “I will make my decision depending on where the greatest sporting challenge lies. Finances, in this context, mean very little to me. Bendtner admits he is growing tired of discussing his future, with Denmark coach Morten Olsen having joined the chorus of those urging him to move on. After initially refusing to speak about the matter on Wednesday, Bendtner added: “I was sick and angry of answering questions yesterday. “I think I had said that I did not want to comment on questions about Arsenal and I became sick of it when asked the third time. Wojciech Szczesny has signed a new long term-contract with Arsenal Football Club. Now in his third full term as Arsenal goalkeeper, the Polish international stopper has developed into an assured presence in the Arsenal backline. Having finished last term strongly, with four clean sheets in the final six games of the campaign, Szczesny has gone on to play a key part in the Club’s strong start to the 2013/14 season. Most recently, keeping two consecutive clean Premier League sheets in strong performances against Crystal Palace and Liverpool, and also putting in an eye-catching performance for Poland against England in last month’s World Cup qualifier at Wembley. Szczesny, 23, joined the Arsenal Academy in 2006 from hometown club Legia Warsaw, who he had already represented at first team level as a 15-year-old. Since making his Arsenal debut in a League Cup victory over West Bromwich Albion in 2009, Szczesny has already featured 121 times for the Gunners. Szczesny said: “I am very pleased to have signed a new contract. Arsenal is like my family and I’m so happy to be committing my long-term future here. I’ve been at this Club for over seven years now and I’d just like to take the opportunity to thank everyone for their support towards me during my time here. Everyone at the Club is looking forward to Wojciech’s continued contribution in the years to come. 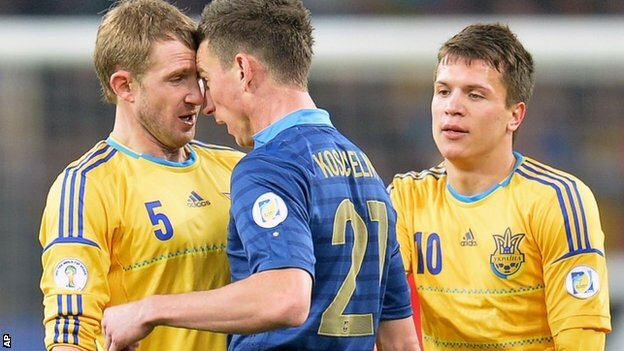 France’s hopes of qualifying for the 2014 World Cup in Brazil suffered a major blow as Ukraine won the first leg of their play-off tie. Both teams ended with 10 men after Laurent Koscielny and Olexandr Kucher were sent off in stoppage time. But the damage had already been done as Roman Zozulya side-footed home after being put through by Andriy Edmar. Koscielny then conceded a penalty for bringing down Zozulya, allowing Andriy Yarmolenko to convert from the spot. The victory on home soil will give Ukraine, who have lost their previous three World Cup play-offs, confidence ahead of Tuesday’s second leg in Paris. Ukraine’s advantage also leaves Didier Deschamps’s men facing the prospect of failing to qualify for a major tournament for the first time since the 1994 World Cup. Ukraine have lost their previous three World Cup play-off ties – Croatia (1998), Germany (2002) and Greece (2010). France last failed to qualify for a major championship when they were beaten in the World Cup play-offs by Bulgaria 20 years ago. Deschamps admitted before the match that his team faced a stern test in Kiev, with the hosts unbeaten in 10 games since Mikhail Fomenko became manager at the beginning of the year. Ukraine have also become adept at keeping clean sheets, with this their eighth clean sheet during Fomenko’s tenure. With Franck Ribery closely marked, France barely troubled the Ukrainians, a volley from Samir Nasri after falling a goal behind the closest Les Bleus came to scoring. Edmar was the architect of the first goal, bisecting the French defence, and Zozulya held firm under desperate French defending to squeeze the ball home from six yards. Ukraine threatened to score a second and were rewarded with the penalty, while Yarmolenko converted. The evening got worse for Koscielny as he was shown a second yellow for raising his arms at Kucher. A perfect evening for the hosts was ruined when Kucher was then shown a second yellow two minutes later for a foul on Mathieu Valbuena. Deschamps said: “Opening the scoring gave them more strength and we made a mistake on the penalty. rge Gnabry believes Arsenal are now a “highly rated” team in his native country Germany. The Gunners claimed a famous victory over Borussia Dortmund at the start of November, and in doing so became the first English side to win at Westfalenstadion in the Champions League. Gnabry acknowledges what a positive experience it was for him to be part of Arsène Wenger’s squad that night. “I really appreciated being there,” Gnabry told Arsenal Player. “I think everyone knows about the stadium in Dortmund. It’s a fantastic stadium, the atmosphere especially with the 25,000 standing on the side, so it was a really great stadium. “Arsenal are highly-rated [in Germany]. We are on a good run and we are top of the league so everyone’s watching us and looking at how we play. Despite losing their last game to Manchester United, Gnabry thinks the players can be pleased with their week’s work before the international break. “Of course the loss against Man United was obviously not that good,” he said. “But I think that we’ve had a great week. We got two wins, important wins against Dortmund especially in the Champions League, and I’m really happy about how it went. Serge Gnabry believes Arsenal are now a “highly rated” team in his native country Germany.